Full Classification: Phylum Chordata, Sub-phylum Vertebrata, Class Mammalia, Oder Artiodactyla, Family Cervidae, Sub-family Cervinae, Genus Cervus, Species Cervus Nippon Nippon. Sika are indigenous to eastern Asia, the Japanese islands, Taiwan and the mainland from Manchuria to Vietnam. The word ‘Sika’ is Japanese for deer. In 1860 the seventh Lord Powerscourt introduced one stag and three hinds to his estate near Enniskerry in Co. Wicklow. In 1865, Lord Powerscourt translocated one stag and two hinds to Muckross estate in Kerry where they flourished. Sika have spread to most of the counties of south Leinster including Dublin, Kildare, Carlow and Kilkenny – spreading relatively quickly where there are areas of interconnecting forestry. However there are reports of Sika appearing in Laois, Galway, Mayo, Tipperary, unlikely to have occurred by natural expansion, suggesting human assistance at some level. The male known as a stag, weighs between 50-60Kg; females referred to as hinds weigh between 30-40Kg. the Adult male has a shoulder height of 7- to 95cm, while the hind is somewhat smaller, 50 to 90cm at shoulder height. Hinds give birth to generally a single spotted offspring (calf- approximately 2Kg) from May to early June after a gestation period of 7 ½ months; twins are a rare occurrence. The summer coat is a light-reddish brown colour with white spots. In contrast the winter coat is dark grey with the white spots virtually disappearing. A distinctive feature is the black-bordered white rump patch, present year round, when alarmed, this patch of hair will flair to two or three times its normal size. This is an alarm mechanism to alert other deer in the group to a potential threat. There is a distinctive dorsal black strip, which is prominent in both winter and summer coats. The Metatarsal gland is white as opposed to cream coloured in Red deer. The tail is medium-long, but shorter than fallow deer. The Sika stag has a distinctive ‘V’ shape to the forehead, formed by lighter coloured hair on the forehead. 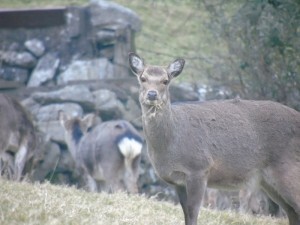 Sika deer are predominantly grazers, feeding upon grasses, broad leaf buds, heather, and coniferous tree shoots. They can readily adapt to sparse conditions found in conifer plantations as they have a preference for acidic soil habitats. The rut or breeding season begins at the end of September and usually runs until November. Stags and hinds remain segregated for most of the year, only coming together during the rut. Wallowing by the stag is done , here they tend to use their musk glands as well as urinate over themselves, thus creating a distinctive ‘rutting’ smell. During the rutting period the stags have a enlarged shaggy neck (common in most deer species). Sparring occurs in early September when stags reach their prime conditions. Mature stags defend their territories ruthlessly (unlike reds which hold a harem), only towards the end of the rut, when the stag is exhausted will you see younger animals taking advantage to mate an unguarded hind. Stags give a high pitched whistle during the rut; use of this ‘whistle’ may be used to attract hinds, mark out territories and warn off potential rivals. When alarmed both sexes give out a short high pitched bark. The typical mature Sika stag has an eight point head, four points on either antler. Brow tines are always less than 90 degrees to the main beam. Whereas feeding has an important part to play in the size of antlers, genetics are important. The heads of Wicklow Sika tend to be stronger and heavier than Sika elsewhere, perhaps reflecting presence of red deer genes. 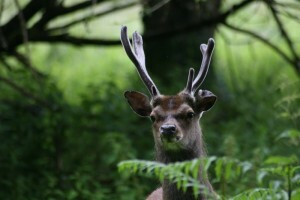 Wicklow heads develop from six to eight points at an earlier age than, for example, the Sika of Co. Kerry, where a six point head is regarded as the norm. Antlers are cast at the end of March. In areas where there is little available feeding, particularly in the winter and the spring, they are responsible for severe browsing damage to young trees and for bark stripping in semi-mature plantations. Bole scoring, ripping off of bark with antlers, a common trait of Sika deer in the UK, is relatively rare in Ireland but is does occur. The Sika rut is the same as that of the Red deer, from the end of September to the beginning of November. Stags can be very aggressive, chasing and fighting other stags and thrashing vegetation.